Globalization. Digital disruption. Consumer activism. Activist investors. Aging population. Geopolitical instability. Economic volatility. No matter the nature of a company today, the unprecedented rate of external and internal disruptors is clear. With these constantly increasing and varied forces, organizations are required to transform more frequently than ever before to stay both competitive and profitable, while also attracting the best talent. So, can a company effectively transform a culture amidst disruption? What does that look like? What does it take to lead a culture based on continual disruption? What cultural attributes are key when going through a disruption? Can you have one culture or is it a matter of what you dial up/down at any point in time? How do you manage this? Can cultures that favor stability (predictability, consistency, efficiency) survive? Reinforce what won’t change. Providing employees with the baseline of “what won’t change” instills confidence that they still belong and also helps employees see themselves in the new “transformed” organization. This, in turn, produces a sense of stability, giving a solid foundation from which culture change can begin. Start by answering the question: what cultural attributes have made our company successful that will continue? Identifying these consistencies and communicating them across the employee base is critical to driving transparency, maintaining business continuity and building trust. Practice what you preach. The way companies operate, invest, make decisions, measure and reward leaders and employees is what ultimately defines a culture. If these behaviors do not align to the “written” culture, then a hard look in the mirror is required. For example, a culture that says “we focus on teamwork” yet rewards individuals, does not align. Or a culture that states “customers come first” yet makes decisions foremost on shareholder interest is not walking the talk. If there is a discrepancy in your culture, you must pause and take action. Either the stated culture must be redefined to reflect the actual operating measures or operational decisions must change to reflect the aspirational culture. Say:do is critical. Recognize that culture can be situational. You can have sub-cultures in an organization. Sub-cultures require common values and behaviors at the top, yet flex and adapt based on their situational environments. They can be geographic, by industry or specialty or type of workforce, and mostly exist in organizations that are large, global and matrixed. As leaders are aware of sub-cultures and they embrace them, organizations will be better off. For example, cultural mantras like “fail fast” or “take risks” may not work on a factory floor. Understanding and recognizing these differences from the beginning will help enable more effective transformational change and ultimately strengthen a company culture. Seek alignment and engagement. 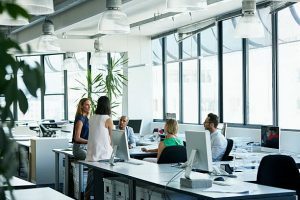 Sure, leaders can act quickly to implement change, dismissing the time required to connect and communicate with employees. However, the long-term impact of this decision would backfire and result in organizational chaos. While undergoing culture change, leaders must devote the time to communicate and listen. They must demonstrate empathy and show they care. Being present and providing space for two-way dialogue not only builds credibility and trust, but ultimately tees an organization up for hugely successful change implementation. Our discussion at the Annual Conference was first of many as we embark on a Page research project asking what it takes to successfully lead a cultural transformation in a world full of disruption. I’d love to hear your thoughts. How would you answer the questions posed in our discussion? I welcome your input and look forward to sharing our full analysis in 2019!